He grins, blending into the red soles of his eyes. He crumbles into angel dust. Lydia Hounat is a British-Algerian poet from Manchester, England. She has been published with Myths of the Near Future: Dystopia, The Cadaverine, Ink, Sweat & Tears, with an upcoming publication from Brain of Forgetting. An avid performance poet, she has worked with the Manchester Literature Festival showcasing slam pieces with authors and poets, and regularly performs in bars and cafés. At 17, she received a Williams Senior college prize for her contributions to the exploration of creative endeavour in poetry. 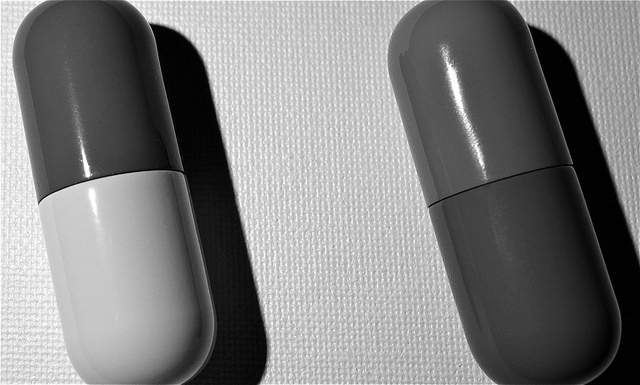 Image: "Pills" by Dean Hochman.